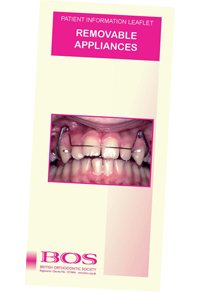 Removable braces are sometimes recommended for correcting a simple problem, for example moving a single tooth. The brace consists of a plastic plate with delicate wires and springs attached. Your brace should be worn full time, unless swimming, playing contact sports or cleaning. Once your teeth are in the correct position then it may be possible to reduce the amount of time that the brace is worn, your orthodontist will instruct you. When removing the brace use the clips at the back of the brace and store in a container to avoid breaking or loosing it. Try to avoid playing with your brace while it is in your mouth, such as clicking it up and down as this can break the brace and thus increase the length of time the treatment will take.